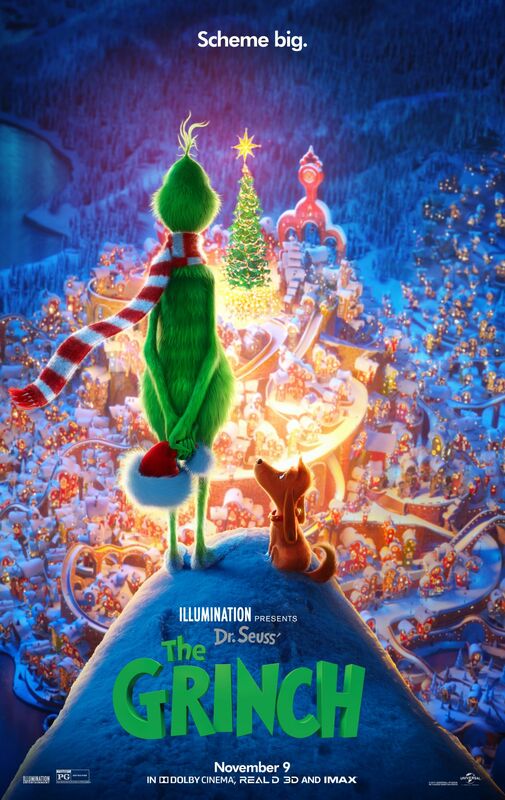 Universal Pictures new animated version of Dr. Seuss’ The Grinch took not only every decoration from Who-ville, but the top spot at the box office worldwide with a global debut of $78.7 million. The film brought in a domestic total of $65.5 million, marking Illumination Entertainment’s lowest opening since 2016’s Sing with $35.2 million. Benedict Cumberbatch lends his voice as the title character of the animated film, it’s directed by Scott Mosier and Yarrow Cheney. 20th Century Fox’s Bohemian Rhapsody fell from first to second place with an additional $30 million domestically, an impressive hold as the musical biopic dropped just 39.6% week to week and crossing the $100 million mark in the US. The film added another $63 million internationally, giving it a global total of $285 million. The film is the studio’s second biggest release of the year following the colossal Deadpool 2 from the summer. Directed by Bryan Singer the film stars Rami Malek, Gwilym Lee, Ben Hardy, and Joseph Mazzello. Also starring are Lucy Boynton, Aiden Gillen, Tom Hollander and Mike Myers. Paramount’s period-horror movie Overlord opened in third place, opening with $10.1 million domestically and another $9.2 million in international markets. With a reported budget of $38 million though, the WWII themed thrill ride still has some major steps to overcome to recoup its costs. Directed by Julius Avery (Son of a Gun), the film stars Jovan Adepo, Wyatt Russell, Jacob Anderson, Dominic Applewhite, Pilou Asbaek, Iain de Caestecker, John Magaro, Mathilde Ollivier and Bokeem Woodbine . Disney’s The Nutcracker and the Four Realms fell from second to fourth place in its second weekend of release, posting just $9.5 million total from the US. Internationally the film brought in $13.5 million for a global weekend haul of $23.1 million. The film’s worldwide total now sits at $96.7 million. Despite the lowest opening for the studio this year, the film will still likely pass Disney’s A Wrinkle in Time from earlier this year, but will remain in the red after costly reshoots and an estimated budget of over $120 million. Directed by Lasse Hallström and Joe Johnston, the fantasy adventure stars Mackenzie Foy, Morgan Freeman, Jayden Fowora-Knight, Helen Mirren, Winchester, and Kiera Knightley. Sony’s The Girl in the Spider’s Web, a reboot of the Millennium franchise, was left in its tracks opening in fifth place with an estimated $8 million domestically and another $6 million from international markets. David Fincher’s 2011 The Girl with the Dragon Tattoo managed $12.76 million in its opening weekend but held strong as counter programming in the Christmas holidays to gross over $100 million seven years ago. The new film will need to cover a lot of ground to even come close to that final tally. Directed by Fede Alvarez, the film stars Claire Foy as Lisbeth Salander alongside Sverrir Gudnason, Lakeith Stanfield, and Stephen Merchant. Warner Bros. Pictures’ A Star is Born fell to sixth place, adding $8 million more to its domestic total and another $9 million internationally. The film now sits at $178 million domestically and has a worldwide gross of $322.8 million. A Star is Born stars four-time Oscar nominee Bradley Cooper and multiple award-winning, Oscar-nominated music superstar Lady Gaga (as Stefani Germanotta), in her first leading role in a major motion picture. Cooper helms the drama, marking his directorial debut. Tyler Perry’s Nobody’s Fool fell from third to seventh place this weekend, adding on just $6.54 million to its domestic total which now sits at $24.27 million. The film is director Tyler Perry’s second lowest grossing movie of all time, ahead of just 2014’s Tyler Perry’s The Single Moms Club which brought in $15.97 million in the US. Nobody’s Fool stars Tiffany Haddish, Tika Sumpter, Omari Hardwick, Mehcad Brooks, Amber Riley, and Whoopi Goldberg. The film is directed and written by Tyler Perry and marks his first film to be released under his new exclusive deal with Viacom. 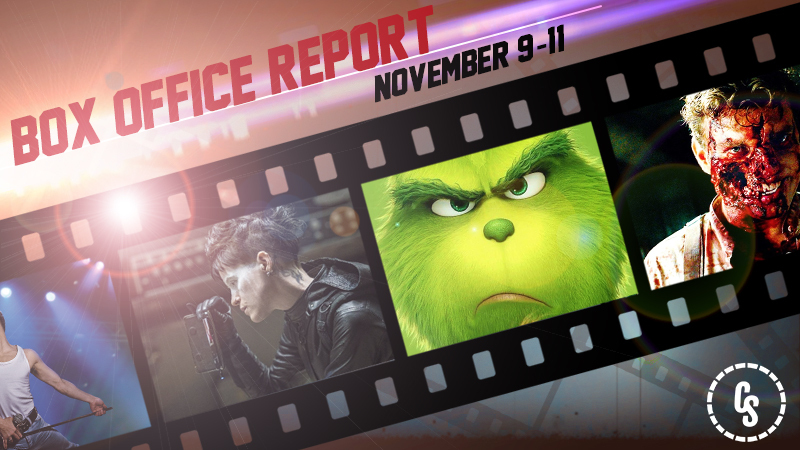 The post The Grinch Took the Roast Beast & Box Office Crown with $78.7 Million Worldwide appeared first on ComingSoon.net.